Deadline — The Orchard has snapped up North American rights to Karen Gillan’s directorial debut The Party’s Just Beginning which made its stateside premiere at the Tribeca Film Festival where it was one of the standouts. The Orchard is planning a fall release for the movie. Shot in Gillan’s Scottish Highlands hometown of Inverness, The Party’s Just Beginning was a passion project which took the Guardians of the Galaxy and Jumanji: Welcome to the Jungle actress six years to write and five to finance before breaking through with Mt. Hollywood Films. She also headlines in the film as Liusaidh, a young woman who is living an endless bacchanal to mask the severe pains from a recent loss. At the same time, a wrong number leads Liusaidh to an anonymous connection with an old man grappling with his own end-of-life questions and regrets. Under fleeting glimpses of the Northern lights, the characters at crossroads in the film, search for answers—together and independently—in the cold landscape. Gillan captures Inverness with a kinetic, somber colorful hued, rapid-edit style, reminiscent of how Nicolas Winding Refn arrested Los Angeles in Drive and Neon Demon. Gillan’s producing partner Mali Elfman produces alongside R. Andru Davies and Claire Mundell. 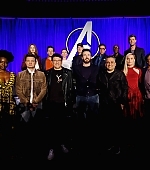 The cast also includes Guardians of the Galaxy star Lee Pace, Matthew Beard, Paul Higgins, Siobhan Redmond, Jamie Quinn and Rachel Jackson. “Totally and completely thrilled to team up with The Orchard on my directorial debut,” said Karen Gillan. “I greatly admire the films that The Orchard put out into the world and I’m honored to have The Party’s Just Beginning be one of them”. The deal was negotiated between The Orchard’s Danielle DiGiacomo and UTA Independent Film Group on behalf of the filmmakers. Gillan is repped by UTA.